Horse race betting can be confusing to the uninitiated. The race programs have a jumble of numbers, abbreviations, and words packed in a very small space to give bettors the information they need to know. The programs at every track is going to be slightly different, but they will all have a key to show what information is located where, adn what the abbreviations mean. Once you are familiar with the program and have made your choices it is time to place your bets. Bets on races close at a certain time, and if you are betting close to post time you have a very short window in which to get your bet in. Efficiency is key for the tellers as they want to get all the bets tabulated before the race begins. They will not hold the race for one more person. When time runs out, you’re out of luck. Knowing what bets you want to place before approaching the window is more considerate to the teller and your fellow gamblers who may be waiting for you to make up your mind. Giving your wager to the teller in the customary order allows them to enter in your bet quickly, without miscommunications or frustrating do-overs. However even if you do give the teller your bet in the customary order, you should always check your ticket before leaving the window. Once you walk away you can no longer change your bet, even if there was a mistake made. How do I place my bet? Once you’ve made your picks, you need to know how to tell the teller what wager you would like to place. If you are making a number of picks it may be easier to write them down so you’re not fumbling to remember what you wanted to bet when you get up to the window. This will also allow you to check your ticket more quickly, which allows the the teller to help more people before post-time. There is a very specific order to the information. Many racetracks will simulcast races from other tracks. If you wish to wager on a simulcast race and you do not specify which track, the teller may assume you are placing the bet on the home track. Wagers can be placed hours before the race is actually run- sometimes even days in advance! Being very specific as to which race makes it much easier on everyone involved. A racetrack will typically run many races during the day, not including all the simulcast races. If you do not specify, the teller may assume you just mean the next race on the home track. Be sure to read the program before wagering. Many tracks have a minimum $2 bet. Depending on the type of bet you place, just because your wager amount is $2 does not mean the price of your ticket is $2. The more exotic bets are many bets combined into one, which can add up quickly, especially if you are betting wheels. Betting to win, place, and show are common bets that even the newest to horse race betting are familiar with. However there are many options in horse race betting, some of which are very complicated. Betting these can be very fun, and quite lucrative, but it’s important to know what you are wagering. Not all racetracks will offer all bets, and the bets offered sometimes change between races. Check the program when you are making your picks! 5 . The number of the horse or horses. Every horse is assigned a number during the race. This number relates to where they are located. The first horse is the closest to the rail. These numbers also make it much easier to bet on horses. Instead of telling the teller the horses’ sometimes long and convoluted names you can simply say the number 1 horse. Depending on the wager, the order you tell the teller the horses can matter greatly. 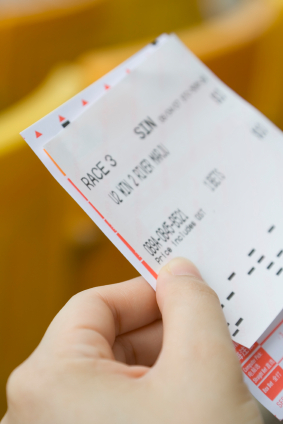 If you are betting an Exacta, for example, you must tell the teller the horse you want to come in first and second in the order you want them on your ticket. If you want to wager the number 2 horse to Win and the number 1 horse to Show you must tell the teller “Exacta 2, 1”. If you say “Exacta 1, 2” you may greatly regret this when your horses come in and you find out that you made a mistake placing your bet. Betting online can be very easy, as online betting websites will do their best to make it easy and clear so you know exactly what you are betting on. Sportsbooks and racing parlors, as well as racetracks all have employees dedicated to making sure bettors enjoy themselves, help you determine your winning and will be happy to answer any questions you may have. If you are not sure, double check!